Last weekend, the hubs and I were in New York City to visit the Morgan Library & Museum so I could clap eyes on the original manuscript for Jane Eyre, my all-time favorite book. The exhibit, Charlotte Brontë: An Independent Will, is well worth seeing if you’re in or near the area, and it will be at the Morgan through January 2, 2017. Here are a few snapshots I took while we were there. A dress once worn by Brontë. Only 4’9″, she was small but mighty! Remember “Bewick’s History of British Birds,” the book Jane curled up with in the window seat? 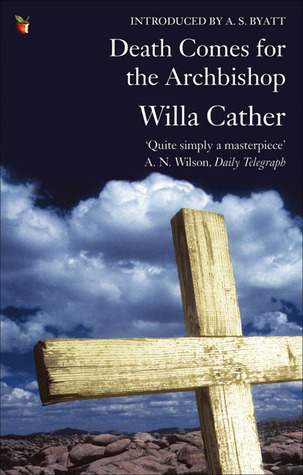 The family owned the book. It was a favorite, and the museum had their copy on display to the page little Jane describes. The portrait of Charlotte known to all fans. If you look to the right, you’ll see the original manuscript of “Jane Eyre,” the only object in the museum I wasn’t allowed to photograph up close. There were several other wonderful exhibits there, including Word and Image: Martin Luther’s Reformation in honor of the 500th anniversary of the Reformation. It, too, was a fascinating collection, well curated and solid in scope. From it, I learned a great deal not only about Luther himself but also the men who helped get his message out and the printing press, that revolutionary machine that democratized the Christian faith in Europe. 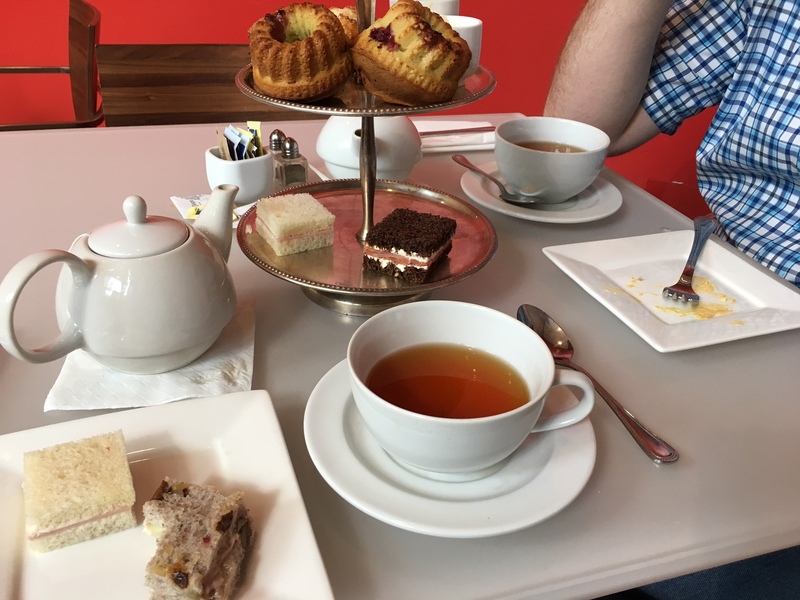 In between exhibits, we went super fancy and had high tea. Total “pinkies up” experience for both of us. We finished our day by visiting Pierpont Morgan’s 1906 library, divided into the North Room and West Room—both of which I was too busy ogling to take pictures of—and the amazing East Room that took my breath away. 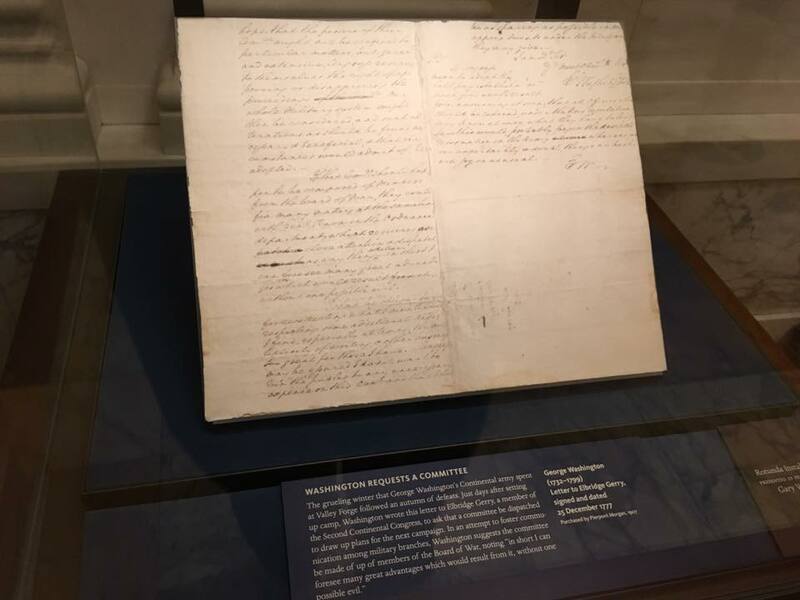 But it was in the rotunda, a dazzling space of marble and light that divides the libraries, that I came across something unexpected: a letter written by George Washington on December 25, 1777. As you can see by the paragraph below the document, this wasn’t a document of great import. It wasn’t penned to celebrate the victory at Trenton, the loss at Brandywine, or the British surrender at Yorktown. It was simply a letter written to Elbridge Gerry, a member of the Second Continental Congress, requesting that plans be drawn up for the campaign that would take place at winter’s end. It’s the 18th century equivalent of an inner-office memo, but it stopped me dead in my tracks. I viewed this document on Saturday, October 8th, less than a 24 hours after Donald Trump’s Access Hollywood video surfaced and only a few days after Wikileaks dumped emails from John Podesta detailing the inner workings of the Clinton Campaign. Up until that moment, I had been floating on a cloud, five hours removed from the outside world and happily ensconced in a beautiful building surrounded by erudition and polite, dignified people. For a moment, I’d forgotten about the ugliness of the world outside the Morgan’s doors, especially the nefariousness that has been the 2016 election season. 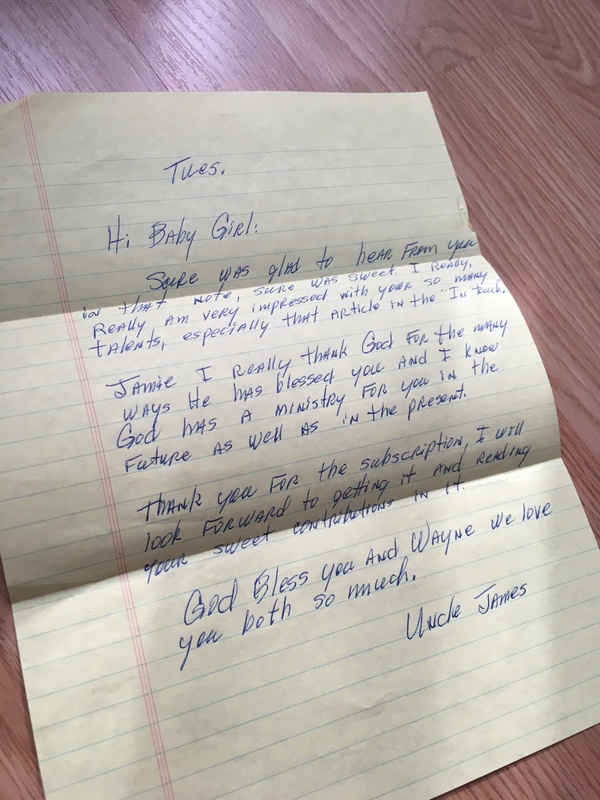 But, looking at this letter, I couldn’t help but be confronted by it all over again in a way I never expected. Consider this. Washington was the United States’ first president and served two terms. He did so not because he wanted to but because he felt he must, and when his time of service was over, he surrendered power for the second time and walked away. Imagine a president doing that now. Imagine Trump or Clinton surrendering authority, doing something for the greater good of the United States. Yeah, I know. It’s disheartening. There’s evidence of it in the letter at the Morgan. I wish my photo of it was high-res so you could see for yourself, but believe me when I say his handwriting was immaculate. Each line was perfectly straight, every letter was exact. All leaned in the same direction and at the exact same angle. Any letter below the line had identically-sized loops. And he did this on a portable writing desk or rickety table in poor light, likely after a long day. Where did he learn such perfect penmanship? Like so many things, at school and through tireless repetition. Thankfully, this man set the standard other men (and perhaps one day women) should strive for as president. And today, less than 300 years later, we have two candidates who refer to the American people as a “basket of deplorables” and insist that when you are a star, you can grab women by the p***y and get away with it. But Trump and Clinton didn’t force themselves on us. Both are products of a country who relinquished its ideals, who allowed ignorance to be celebrated rather than rejected, and who stopped actively participating in the grand, messy experiment that is the United States of America. Both he and she fall so short of the standard we should expect of a president–and of ourselves–that I stood before that humble, prosaic letter in the Morgan and cried. For Washington, for myself, and for this beautiful country. If you would like to read other letters by Washington, I highly recommend this page created by the University of Virginia. 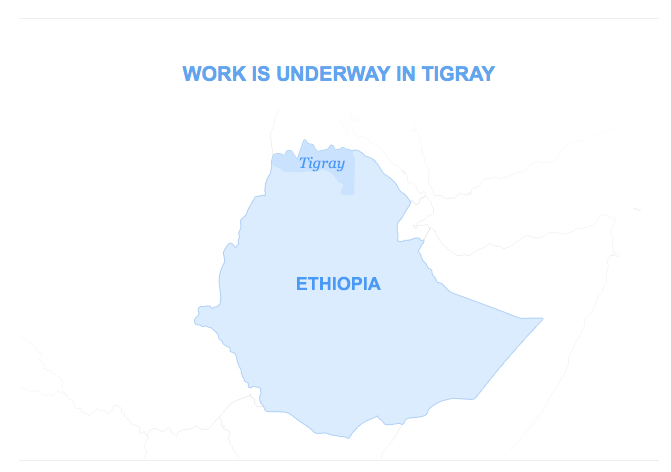 This site is also very interesting. Yesterday, I was added as a contributor over at The Mighty, a website that publishes “real stories by real people facing real challenges.” It’s an amazingly honest and encouraging place for people who have disabilities, chronic/rare diseases, or mental illnesses. 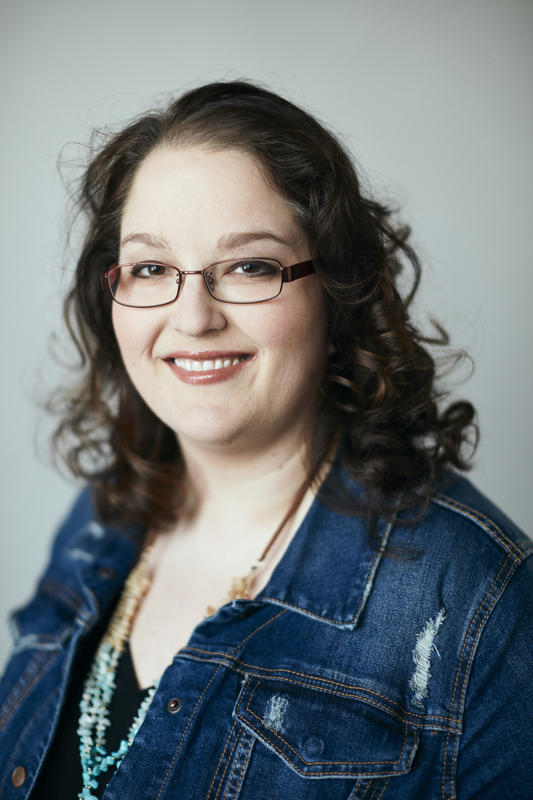 As someone who has one of the many conditions listed on their site (Multiple Sclerosis or MS), I was thrilled to be able to add my voice to their robust community. If you’d like to read them, please click here. Seeing my story on their page and reading those of other people whose lives have been impacted by MS, I started thinking about the value of words. Ever since I was little, I’ve always loved working with them, stacking them end to end to make a beautiful sentence or poetic phrase. I love the way certain words sound (Go ahead and say “mellifluous” out loud and fail to enjoy it. I dare you.) And even after 30+ years of using them, I’m still amazed at the way they can morph from noun to adjective (novel), adjective to verb (stiff), verb to noun (grid). But I didn’t come by this lifelong obsession naturally. Many of my family members are readers, some more voracious than others. But only a few are writers, and most of them are in my generation. 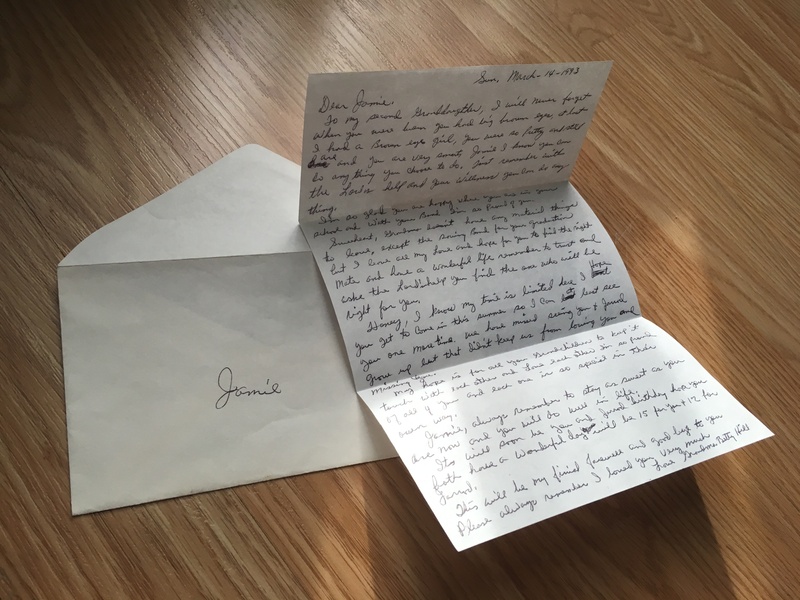 I have a few letters and handwritten notes written from loved ones who have passed, each of which I treasure, but there are entire branches on my family tree that have died without leaving a single syllable behind. 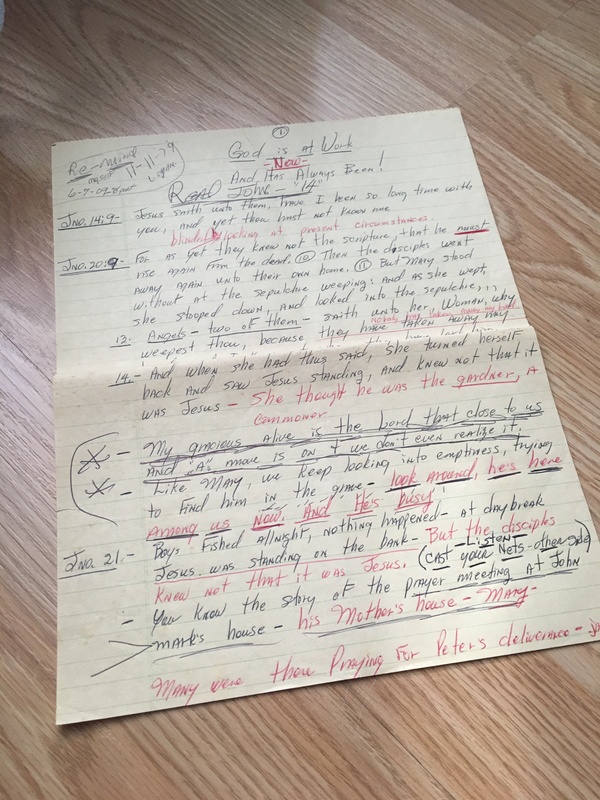 I have sermon notes and a short letter from my great uncle James. A letter from my paternal grandmother, Betty Lou Hill, given to me just weeks before she died. 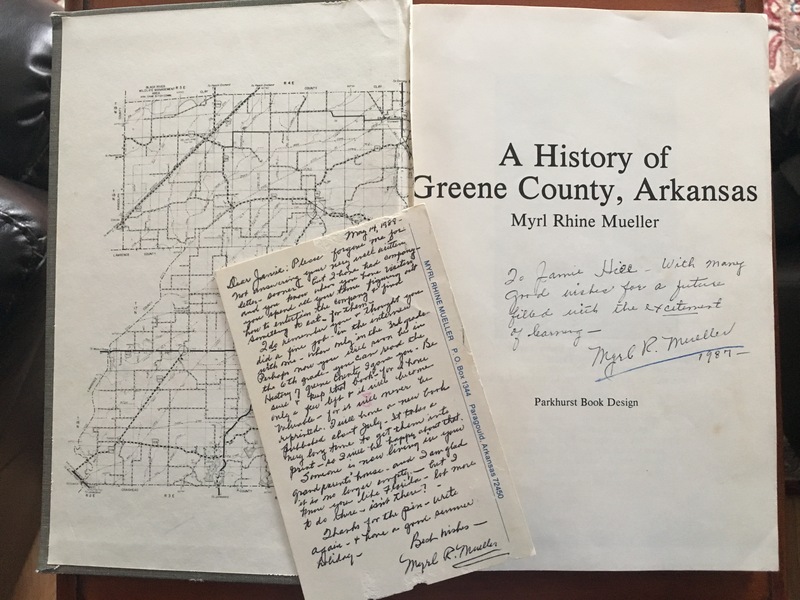 I even have a postcard and a book inscription from Myrl Rhine Mueller, a lady in my hometown who published a book about the history of Greene County. When I was in third grade, I lugged a boom box to her little house, which was down the street from my grandparents’ and conducted an interview with her for a history project. But there are no diaries, no journals, and no handwritten notes in the margins of beloved books. It’s an absence I’m feeling more acutely these days as members on both sides of my family pass away. I can no longer ask Papaw, my maternal grandfather, his thoughts on a current event or hear about the things he had a passion for. He loved to sing. I know that for certain, but I don’t know how singing made him feel or why he enjoyed it so much. He played a small role in the Civil Rights movement too, but no matter how many questions I ask or how deeply I dig, I’ll never know the entire story. In the early 1960s, he was the assistant manager of an S.H. Kress & Co. in Memphis, Tennessee. For many weeks in the late summer and early fall, young black students would stage sit-ins at the Curly-Q Luncheonette inside the store. He was given strict orders that if one happened on his watch, he should immediately stop service and turn off the lights. Some time after this, the protesters would get up and leave. It was always peaceful, always respectful, but every time Papaw flipped those lights, he felt pitiful. He was a boy from rural Arkansas—a farmer’s son, dirt poor in every sense of the word—and some of his closest friends were black. He believed in their cause, but because he had a wife and two young daughters at home, he had to toe the company line and keep the job. But he did the one thing he could do: he apologized to each of them as they walked out. It’s not a big story of great sacrifice or drama, but it’s his. That makes it mine too in some small way, and I love it, despite the fact it’s secondhand and shaggy around the edges. Our two kids, who we are adopting from the foster care system, already have a lot of holes in their stories. Several members of their birth families were also adopted or given up for adoption, so there’s no way of knowing exactly where they came from, who they favor in looks and temperament, who their “people” are. There’s nothing I can do about that, but I do want to leave them a legacy, a heritage of sorts. There will be notes in my favorite books, so they’ll know why I loved them. There will be journals, short stories, poems, essays, and articles. I want to leave behind an ocean of words for them to swim in—to find me and perhaps, in some small way, to find themselves. I thought this quote rather apropos considering that tomorrow is Super Tuesday and Donald Trump is likely to win several states including Tennessee and Georgia. 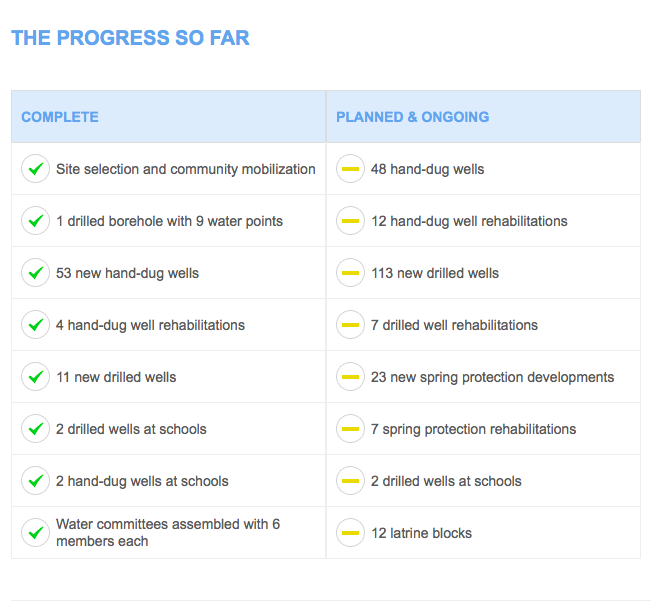 This entire primary process has been confusing and disheartening by turns, and it doesn’t look like things are going to get better any time soon. People have been asking, “How could this happen?” and “Is this really America?” But the truth is, we allowed Trump to rise to prominence. Because we weren’t vigilant, because we didn’t expect and demand better of our representatives, they didn’t think they should bother. They got lazy and complacent, people got angry, and we got Trump. 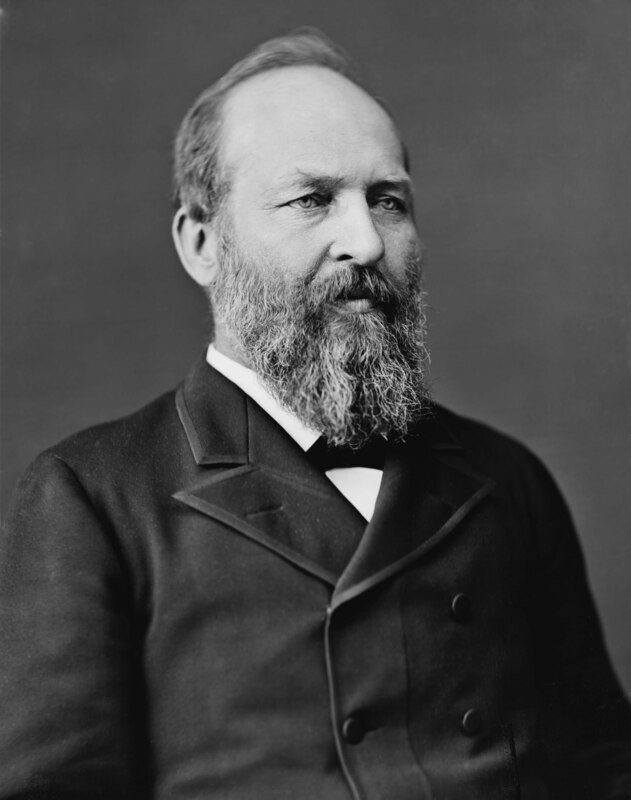 That’s why I wrote a web-exclusive article for In Touch Magazine about my favorite president, James Abram Garfield.If you don’t know much about him, no worries. He served less than a year because he was assassinated in a D.C. rail station and was literally poked and prodded to death by doctors who had no clue what they were doing. If you’re interested in learning more about our 20th Commander In Chief, I highly suggest Candace Millard’s biography, Destiny of the Republic: A Tale of Madness, Medicine and the Murder of a President. It’s incredibly well researched and interesting from top to bottom. The opening paragraphs of my article are below. If you’re interested in reading the rest, hop on over to In Touch Ministries’ website. We’ll be happy to have you! It’s a common question—one that allows a person to give an honest answer without treading too far into politics, one of the verboten topics of polite conversation. The response is understandable. 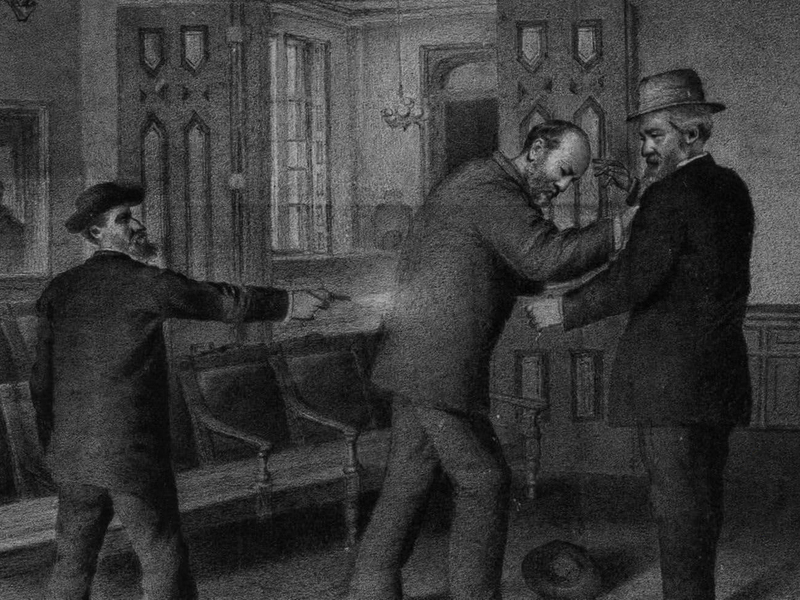 Garfield—the 20th President of the United States—served only 200 days before he was assassinated by a madman named Charles Guiteau. Yet, as is often the case, quality matters more than quantity, and the 49 years Garfield lived before stepping into the Oval Office are a far better measure of his worth—an example of humility and service we Christians would all do well to study…. There’s a popular adage that reminds humans the best course of action when interacting with nature is to “Take only pictures. Leave only footprints. Kill only time.” But apparently, we can’t even manage that anymore. 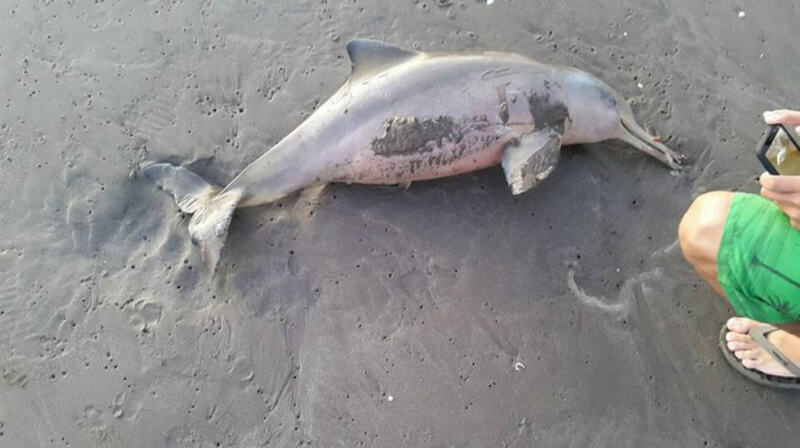 Last week, an unfortunate baby dolphin, more specifically an endangered species known as a La Plata or Franciscana dolphin, was plucked out of the ocean and onto an Argentinian beach. The reason? People wanted to pet and take selfies with it. Yes, selfies. With a dolphin. On land. Video footage of the incident shows a ever-growing mob of people surrounding the poor little thing, cameras at the ready. 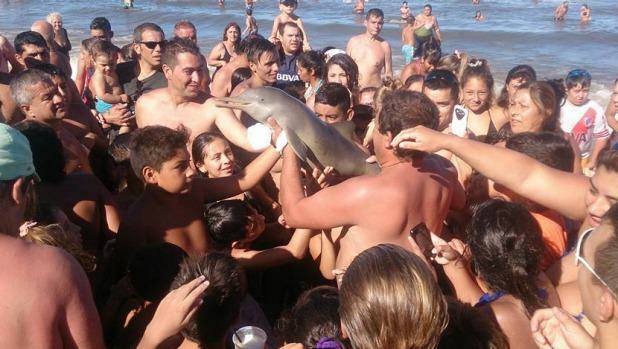 According to Peter Holley at The Washington Times, “At no point in the footage does it appear that anyone in the crowd intervened or attempted to return the animal to the water,” and eventually, the dolphin died from dehydration. But it didn’t stop there. People kept on snapping pictures of its corpse and then left it to rot in the damp, trampled sand. How does something like this happen? We have all seen the reports that women spend somewhere around five hours a week taking, editing, and posting selfies on social media. But that doesn’t mean guys are blameless. Of the one million selfies—yes ONE MILLION selfies—taken each day, men are responsible for about half. And these snapshots do so add up. All told, according to a recent survey, the average millennial could take up to 25,700 selfies in his or her lifetime. Think about that for a minute. 25,700 pictures of one person. Sweet heck. Van Gogh only painted 30 or so self portraits. Rembrandt left us about 90. Frida created 55. If it was sufficient for three of the greatest artists in history to create fewer than 100 images each, you’d think we could survive with a couple thousand or so of ourselves. And by making the comparison, I’m not saying that the self-portrait and the selfie share much common ground. For Van Gogh and Frida, self portraits were a way of exploring their inner demons and giving voice to their pain. For us? We’ll take a selfie just to show how on fleek our eyebrows are or to give ourselves gravitas at serious places like Ground Zero, the Holocaust Memorial, or a funeral. 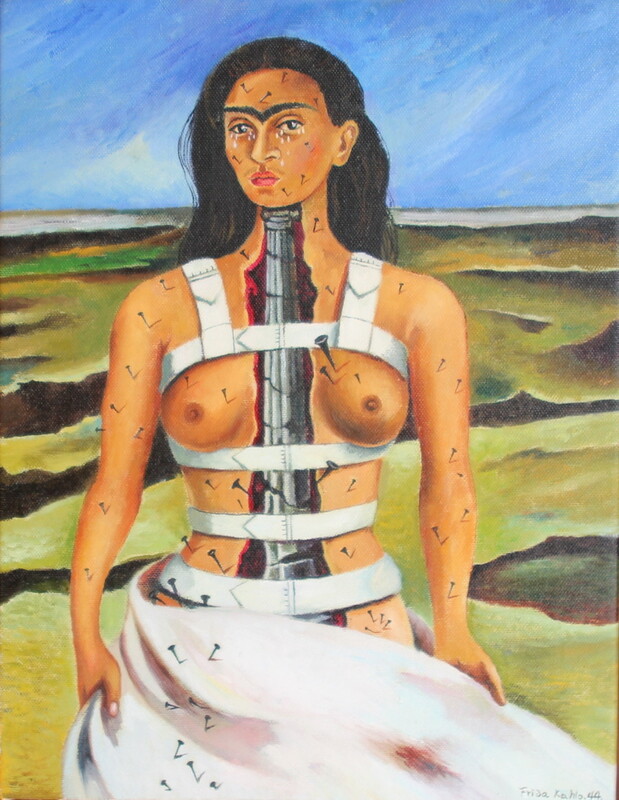 Frida Kahlo, The Broken Column, 1944, Oil on canvas mounted on masonite, 40 x 30,7 cm, Museum Dolores Olmedo Patino, Mexico-City, Mexico. Aldous Huxley said, “Technological progress has merely provided us with more efficient means for going backwards.” And I’d have to agree. We’d like to think we’re a cut above our ancestors, but I firmly believe that if the patrician class had had the means to take them, museums would be full of selfies with the Roman Colosseum in the background. (Along with necessary hashtags like #Lions4TheWin #ChristianItsWhatsForDinner #HailCaesar #BreadAndCircuses4Life) At least they took the time to watch the “entertainment” being provided. We can’t quite manage to stop taking pictures of ourselves long enough to watch nine innings of baseball. We’re too busy being the deities of our own 4.7 inch universes to be bothered to take in the beauty around us or *gasp* interact with people. Now, rather than drink deeply and fully imbibe this thing called life, we frantically try to capture “the perfect moment” on phones. Why bother? There is no camera better than the human eye, no file more detailed than one stored in a human mind. 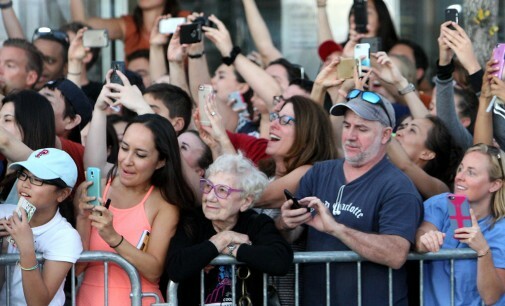 Yet we keep scrambling for our devices, recording our lives rather than living them. How many of us have missed a gorgeous sunset because we were too busy trying to frame it up correctly to post on Instagram? How many fireworks shows have we only seen slivers of because we have to make sure we had something perfect for Vine? How long before we realize the hundreds of images we’re collecting of ourselves our limited worlds are keeping us from enjoying the greater (and much more interesting) places we inhabit? Maybe we don’t want to. Maybe we can’t bear the thought of not being the center of the universe. The Swiss playwright and novelist Max Frisch, who was keen to explore once said that technology was nothing more than “the knack of so arranging the world that we don’t have to experience it.” And for the life of me, I don’t know why we’re willing to make such a poor trade. I’d much rather be the elderly woman at the Black Mass premier than the other folks around her. She’ll have a memory of that red-carpet night that’s more exciting and detailed than anything captured on camera. But maybe that’s how moments like the one on that Argentinian beach happen. People get so absorbed in the egocentric crush to capture what makes them unique that they’re willing to sacrifice anything to make it happen. After all, it isn’t just a photograph they’re taking; it’s proof of life. 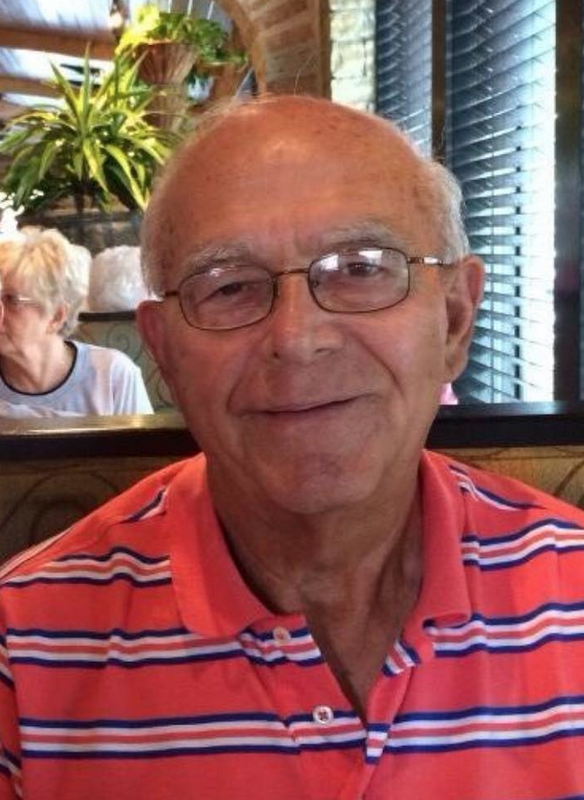 For those of you who have been following my blog, you know that my grandfather, Boyce Dale Lindley, fought a long battle with Alzheimer’s Disease. At 5:42 AM on Wednesday, August 5th, that fight finally drew to a close, and he went to be with the Lord. I am beyond heartbroken for myself and my family, but I am thrilled for him. I know he stood in front of God’s throne and heard those words we all long for: “Well done, good and faithful servant. You have been faithful over a little; I will set you over much. Enter into the joy of your master.” The things we perceive through a glass darkly are clear to him now. Every mystery has been solved. Every tear has been wiped away by Jesus himself, and there is nothing left but joy eternal. To me, there was no finer man on this earth. Patient, hardworking, loving, kind, giving, and gentle—he set the standard to which I hold all people. And it is likely none will ever measure up. If you knew him and would like to sign his memorial page, you may do so here. Also, we are asking that in lieu of flowers, people would consider giving to the missionary fund at his church. Specifics can be found by visiting the link above. I will be one of three people speaking at his memorial service this Sunday, and I wanted to share my thoughts with you here as well. It is my hope that they will give you some idea of the kind of wonderful man he was. 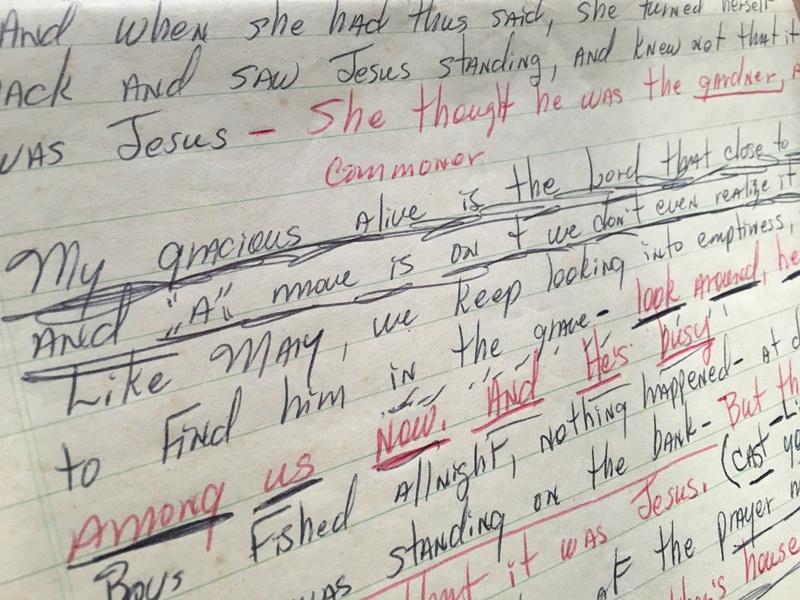 Writing a eulogy is no small task. How do you even begin to explain how much a person meant to you or how his presence in your life changed everything for the better? As a writer who believes in the power of narrative, I thought it best to begin with short stories, snapshots that would give you all a sense of the man Boyce Lindley was. I began recalling memories, scrambling to write them down, and then discarding them almost as rapidly as they came. One was too flippant. Another was a family joke that would take too long to explain. A few were much too sad for a “homegoing” like this one. There were moments I remembered vividly, but when I held them up to the light of others’ recollections, I realized I had embellished mine a bit—decorated it with prose-y flourishes that filled in the gaps and made it more satisfying. But just because it’s satisfying doesn’t make it true. 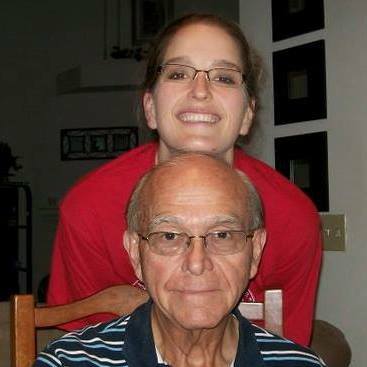 And if there is anything I hope to do for my grandfather today it is to speak truly of him because he deserves nothing less. There are people I’ve lost after long battles with cancer—my great uncle James, my young friend Trevor Alexander, a bright and promising student named Catie Carter—and remember them well. For each, there are bright, concentrated moments, as golden and gilt as the ceiling of the Sistine Chapel. But for all their brilliance, they are but a scant handful of memories. Bright drops of color on the canvas of my life. But for my grandfather there are no standout moments, no highlight reel I can play, no bullet list to quickly go through to explain why he means so much to me. At first, this realization caused me no small amount of panic. What kind of granddaughter was I if I couldn’t remember my precious grandfather down to the most meticulous of details? And there was grief too, wedged between my ribs, thick and immovable, because I believed I had somehow lost something in my negligence. That somehow all the years of knowing Boyce Dale Lindley had been rubbed away and faded by time, never to be returned to me. 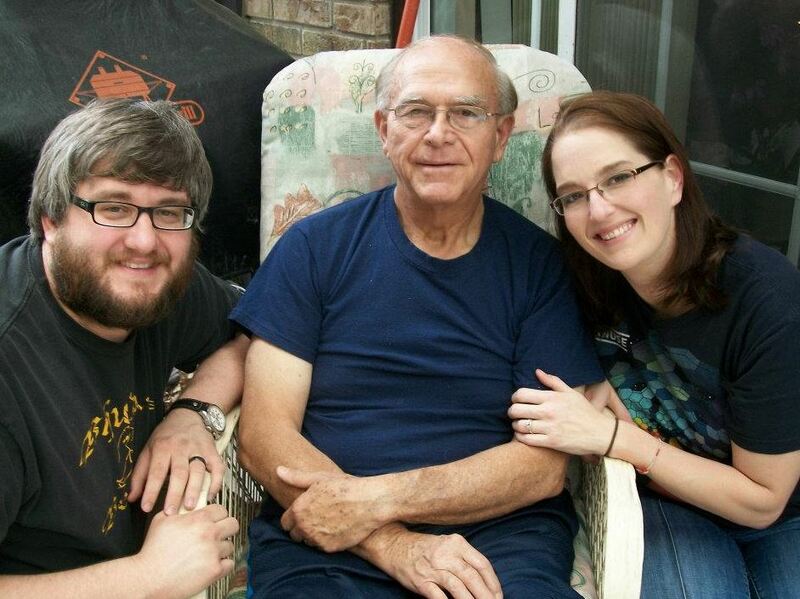 But then I thought about my grandfather and the kind of man he was. He was rarely front and center in our family. That was a task he left to my grandmother, his two bright and vivacious daughters, and his three gregarious grandchildren. No, he was happiest watching others, sitting or working quietly on the periphery—helping when and wherever he was needed. Always there, always in the moment, in a supporting role. You would always find him out front sweeping the sidewalk, whistling to himself, washing dishes in the kitchen, or taking out the endless bags of trash our family seems to create every time we’re together. Thankless but necessary jobs—ones that he happily completed for decades. There was but one exception to this rule. At the gaming table, he was a king. He was also our scorekeeper, arch nemesis, and teacher extraordinaire. 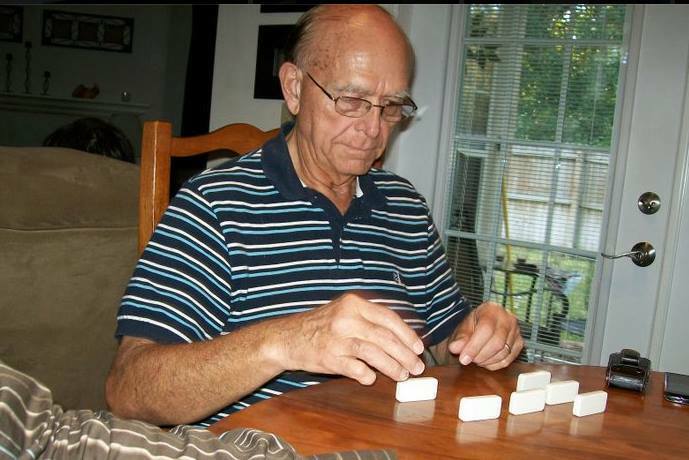 He was never one to turn down a hand of dominoes or hearts, beloved games in our family. In fact, he played them both like a Vegas-level professional—with remarkable skill and style. No matter how many steps ahead you thought, he had already gone as step or two further. He was man who had no college degree to his name but could manage to complete complicated math problems in his head and remember years worth of sales figures on the spot. As I was fond of saying regarding his talent with the bones, “Papaw could make off a dead dog.” And though he beat you consistently, you couldn’t find it in yourself to get upset—because on those rare occasions the victory was yours, he’d celebrate like it was his own. I didn’t spend time with him sporadically, as I did with my beloved great uncle James, or know him for only a few short months, which was the case with Trevor and Catie. Boyce Lindley was there in the hospital when I was born. He swam with my brother and me for hours on end, long after he was waterlogged and ready to get out. He was a part of Sunday dinners, fish fries, church picnics, and cookouts. He was there for the big moments—recitals and holidays and graduations, family reunions, trips to Disney World, and days at the beach—and for all the run-of-the-mill days in between. For 30+ years, this man was an ever-present and influential participant in my life. That’s not the kind of exposure that leaves behind a few bright blobs. No, it’s the kind that saturates everything it touches. Boyce Lindley is in my DNA yes, but that’s just simple genealogy. What matters more is what he did in this life. That has sticking power. And it’s tucked deeply into the marrow and bone of me. I am patient because I never once saw him lose his temper. I give of my finances and time because he showed me how important it was to do so. When I am kind, the person on the receiving end has Boyce Lindley to thank for it. I know what it means to be a Christ follower because I watched him do it without fail for 37 years. Each moment with him was like a drip of bright blue that fell into the clear pool of my heart, gradually turning it from sky to cornflower, cobalt to navy. That’s why I have no standout memories that feature him alone in the starring role. Simply put, there is no dividing line between us, no moment where he ends and I begin. I am thoroughly infused with him—each member of my family and every person who ever had the privilege to know him is too. And in that way, he will live on in and through and even beyond us. So yes, today we’re all blue, but not only with sadness. And that’s a very good thing. Until recently, I would have taken issue with this. In my mind, nature is beautiful for its own sake. After all, it’s created by a God who delights in lovely things. And even if we never truly “saw” and understood it, that beauty would continue to exist in the world because He wishes it to. That being said, I have always believed art can help us appreciate the excellence of the natural world in new ways or to a greater degree than we did previously. 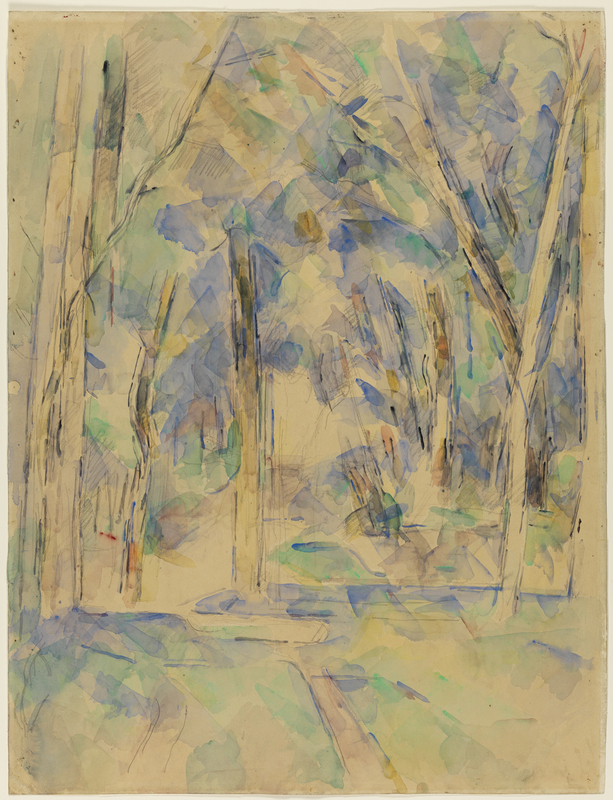 For instance, take the watercolor by Cézanne below. 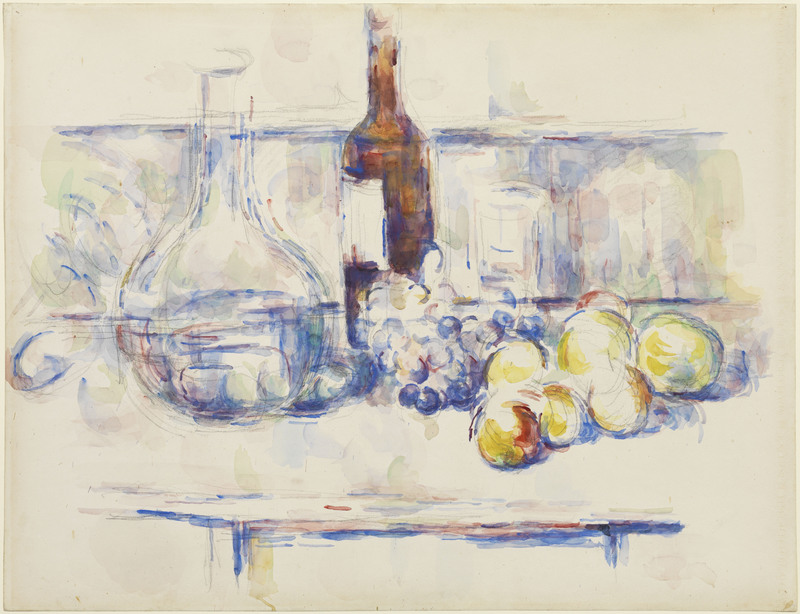 It is currently on display at the High Museum as part of a collection called Cézanne and the Modern, which will be in Atlanta until January 11, 2015. I highly recommend getting the High’s audio tour. There are typically two tracks–one for adults and another for children–and I often listen to both as they contain different information. For only $6, you get a lot of extra information about the artists as well as a few lessons on art history. I can appreciate the loveliness of a forest path dappled with light. I’ve walked many of them and experienced the peace and tranquility they have to offer. I’ve noticed the quiet interplay between light and shadow, heat and cold. But I’d never noticed the different colors light can create in such a space. A few days after learning this information, I took a walk around Kennesaw Mountain National Battlefield Park and noticed that the light that passed through green leaves took on an entirely appearance than it did when it passed through yellow and orange leaves. Both were beautiful but in different ways, and Cézanne (and Simms) showed me how to appreciate the contrast. I also learned Cézanne loved to emphasize something called the “kinship of forms” or “forms that rhyme with one another” in his work. For example, notice the apples, grapes, and carafe in this piece. They all share a harmonious roundness. Their shapes “rhyme” with one another, which is an interesting word choice that I quite like. The apples and grapes aren’t as perfectly spherical as the belly of the carafe, but there’s an undeniable “sameness” to them. Like the words “place” and “grace,” these shapes rhyme. They look as similar to my eye as the words sound to my ear. Learning this didn’t just help me see the world around me in a new or better way. It changed how I understood the things I perceived. It made me think Wilde might have been on the right track. Last weekend, it was blustery here in Georgia. It was the kind of wind that gave the cold air a set of teeth and helped it bite through denim and fleece. I was loathe to go out in it, but I’m glad I ended up braving the elements. While I was sitting in traffic, I noticed a jumble of leaves–orange, red, yellow, and brown–swirling on the street. The wind whipped them into graceful swoops and spirals of color. The sight was lovely to be sure, but nothing I hadn’t noticed before. But the same wind was also buoying the birds in the sky. Like the leaves hovering inches from the ground, the small birds were all angles, and they danced around one another in an intricate pasodoble of tail feather and wing. For a few seconds, flora and fauna moved with an inexplicable synchronicity. They “rhymed” with one another. Alone, each one would have been lovely and ripe with meaning. But together, they revealed the harmony of earth and sky and became something altogether different. I’m not sure if life was imitating art or the other way around, but for the briefest of moments, I was presented with something sublime. What about you? Have you ever had your perception altered by something artistic? Do you think music has the same kind of power as visual arts? What about dance? I’d love to hear how the two work together to shape your viewpoint. Woohoo! 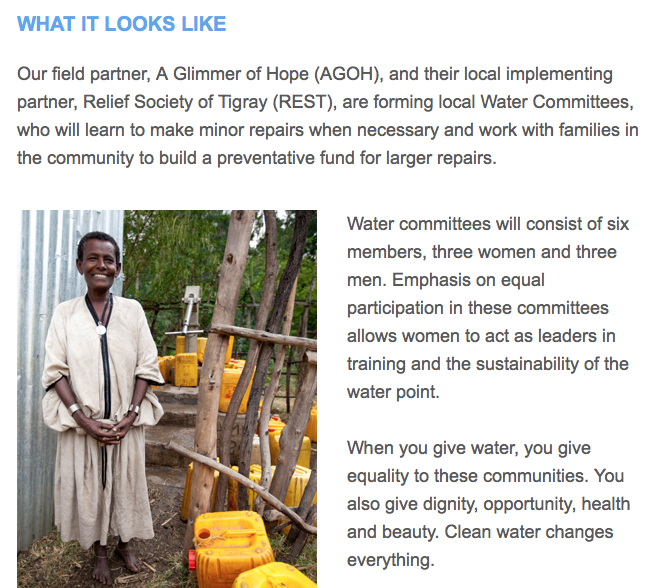 A Charity:Water Project Update! 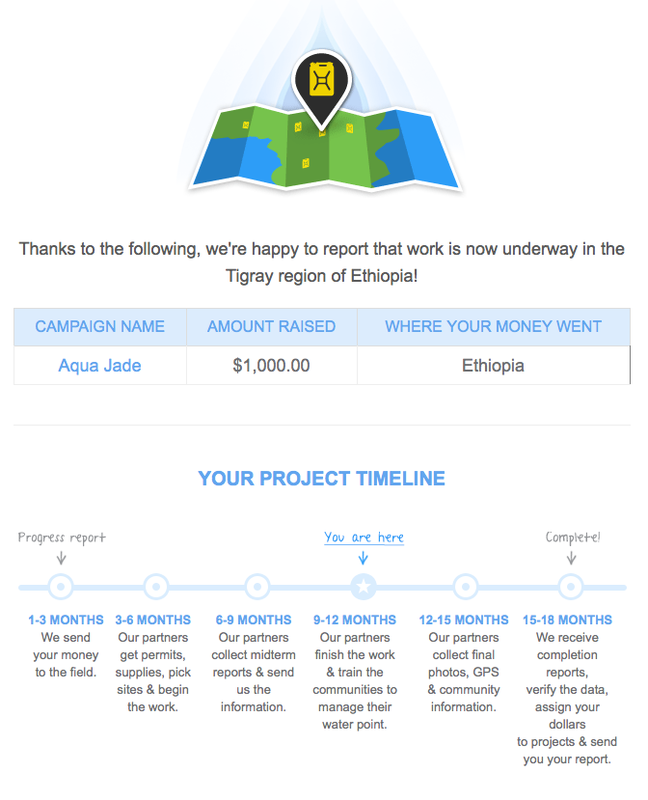 After many months of anticipation, my donors and I got word that the charity:water birthday project completed last year has moved to the next step in the process. Here’s what we learned!